This selection of picture postcards provides a sometimes startling reminder that the Great North Road (the A1M motorway of its day) ran through the heart of Hatfield, and of how Hatfield has changed. 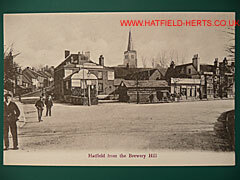 It represents a small number of early Hatfield postcards. Still, they allow us to travel through Hatfield – mainly the area now known as Old Hatfield – in space and time. Please note: more information on postcards can be found under the Hobbies and Collections section. 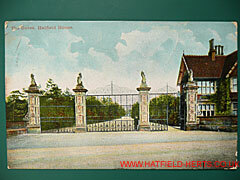 The Gates, Hatfield House – colourised, used Valentine's Series postcard. Postmarked 9 October (year illegible). Position of the gates and the absence of the statue shows it is clearly pre-1906. 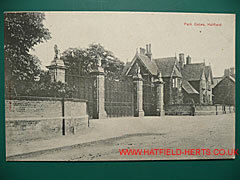 Park Gates, Hatfield – unused, undated and unbranded postcard. Shows the position of the gates before they were moved back when the statue was installed in 1906. 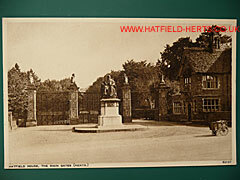 Lord Salisbury's Statue and Park Gates, Hatfield – unused, undated Photochrom postcard. Gates have been moved back behind the entrance to the Gatekeeper's lodge. Hatfield – Arm & Sword Yard – colourised Hatfield Series (No.18) postcard. Postmarked 27 August 1907. The Arm and Sword Yard connected Park Street with the Great North Road. 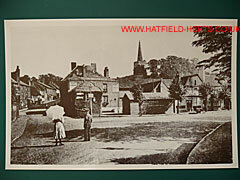 In this view the Hatfield Arms (once the Great Northern Hotel) is at the end on the right. 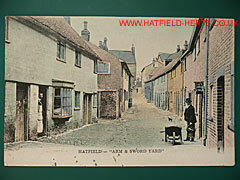 Park Street, Hatfield – used but undated colourised Ralph Humphry, Hatfield postcard. Sign for The Horse and Groom on the right. Directly opposite on the left is a sign for 'Humphry, Printer & Stationer', which is next to The Butchers Arms – a Pryor Reid & Co Ltd pub (please see Claims to Fame – Brewing). Park Street, Hatfield – used, undated colourised The Knight Collection of British Views postcard. Shows Park Street from the opposite direction with the viaduct visible in the background. 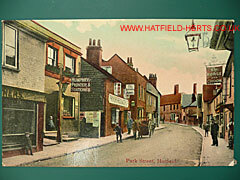 Hatfield, Park Street – unused, undated Hatfield Series (No.16) postcard. 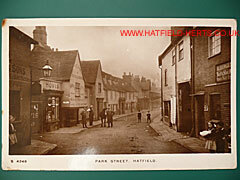 Park Street, Hatfield – used but illegibly postmarked Kingsway Real Photo Series postcard. Bit further down the road from the view above. Shop on the right is 'H Burgess, Boot and Shoe Shop', while across the road where the people are standing is a Hovis bakery and tea shop (possibly owned by George D Easton). 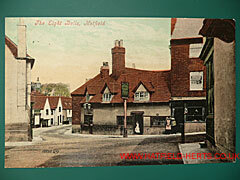 The Eight Bells, Hatfield – used, with the date June 1908 written on it. Valentine's Series postcard published by J Cox, Hatfield. 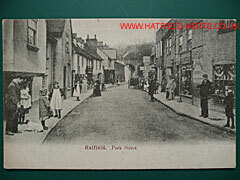 Hatfield – unused, undated postcard. 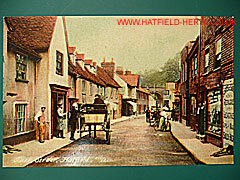 View of the Great North Road as it entered the heart of what is now Old Hatfield. St Etheldreda's Church, complete with the spire that was removed in 1930, is visible in the background. The road and buildings were 'lost' in the post-war redevelopment. Brewery Hill, Hatfield – unused, undated Kingsway Real Photo postcard. Pub on the left is the The One Bell (complete with livery stables) with the Dray Horse inn and refreshment rooms on the right. This area is now occupied by Andre House and Marychurch. 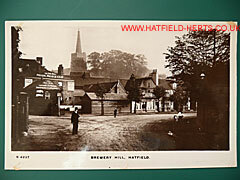 Hatfield from the Brewery Hill – unused, undated Hatfield Series (No.20) postcard. Brewery Hill is now part of Salisbury Square. Fore Street is visible to the left. 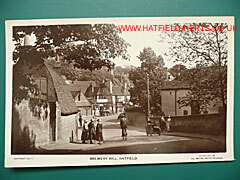 Brewery Hill, Hatfield – used, undated Lilywhite, All British Photo Printers postcard. Taken from further up Brewery Hill looking towards the Dray Horse Inn that is visible in the background.